Microsoft’s quarterly financials are out, and they paint a startlingly clear picture of why new CEO Satya Nadella is in such a hurry to scuttle away from the “devices and services” mantra rolled out by former honcho Steve Ballmer just last year: Microsoft’s hardware efforts just aren’t making much money. In fact, they’re actually losing money hand over fist. The company whose very name includes a nod to its software roots became one of the largest hardware empires in the world virtually overnight earlier this year, with its acquisition of Nokia’s vast phones business. That acquisition paid immediate dividends for Microsoft: Last quarter, Microkia actually sold more phones than Apple, at 36.1 million units to Apple’s 35.2. Nokia sold more phones than Apple last year, but at deep discounts. But here’s the thing: Those high-margin iPhones made Apple an obscene amount of money. Nokia’s phones, however, were a mixture of just 5.8 million Lumia smartphones—mostly cheap ones, like the Lumia 520—and more than 30 million non-Lumia (read: cheap) phones. The end result? Sure, Nokia sold more physical phones than Apple, but it nevertheless managed to lose nearly $700 million last quarter. That’s nearly three-quarters of a billion dollars down the drain, for a company Microsoft paid more than $7 billion for mere months ago. With numbers like that, it’s no surprise Nadella recently announced plans to lay off half of Nokia and kill off its Android-based Nokia X and feature phone lineups. Microsoft’s Surface Pro 3 is a bright spot in its tablet lineup, but the company took a huge loss on Surface RT devices. Microsoft’s other hardware divisions didn’t do much better. The Surface line, a titanic money pit since its very birth, finally realized that massive $900 million hit from Surface RT inventory adjustments, which it warned the world about many months ago. Also included in that writeoff, according to the Seattle Times? A hasty cancellation of a Surface Mini that was to have been announced in May. Beyond that, Microsoft kept mostly mum, saying only that the Surface division—which released the Surface Pro 3 this past quarter—made $409 million in revenue. The company, as usual, declined to break out hard tablet sales numbers or the line’s operating profit or loss. It’s very, very likely that Microsoft is continuing its habit of losing money with every Surface sold—just like it is with Nokia’s phones. On the plus side, Microsoft sold 1.1 million Xbox consoles this quarter, an increase of 100,000 units over the same quarter of the previous year, good for an extra $104 million in revenue. An extra 100,000 units is less impressive, however, when you consider that Microsoft was selling only the aging Xbox 360 console this time last year, with the Xbox One then only on the horizon. Microsoft’s been busy backtracking on the Xbox One’s grand all-seeing, Internet-connected vision ever since, and consistently coming in second place in sales behind Sony’s PlayStation 4, month-in and month-out. Xbox unit sales were up, but Microsoft didn’t say how many were the older Xbox 360 vs. the new Xbox One (shown above). Microsoft neglected to identify how many of those 1.1 million Xboxes sold were Xbox Ones. If a great number of those had been next-gen consoles, Microsoft no doubt would have crowed about it. Office 365 is a bright spot for Microsoft. So, in a nutshell: Microsoft’s hardware is stinking up the company’s bottom line. Its bread and butter software, on the other hand, is excelling. The juggernaut that is Office 365 Home Premium added another 1 million subscribers this quarter, bringing the total subscriber count for this rising star up to 5.6 million. The overall Commercial division’s revenues were up $1.28 billion year over year as Azure and its ilk continued to shine. Heck, even Windows licensing revenue increased 3 percent overall in an overall bleak period for PC, as businesses replaced aging Windows XP devices with newer computers. The story's so different on the software side of Microsoft's ledger: Its Azure software for business flourished even as the company's hardware stumbled. 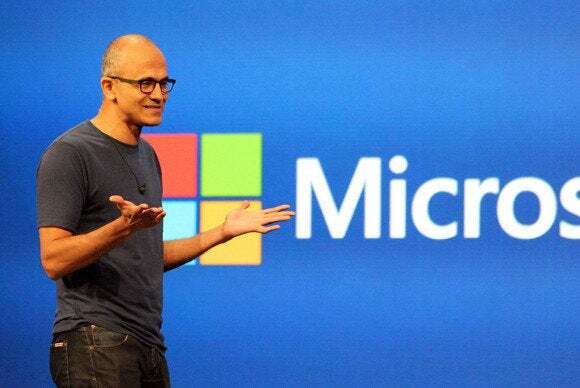 When you contrast Microsoft’s thriving software business with its struggling hardware empire, it’s easy to see why pundits are pounding the table for Microsoft’s device business to be spun off. That’s unlikely to happen, given the halo-like effect the Surface has had on other Windows tablets, the fact that Nokia accounts for more than 90 percent of all Windows Phone usage, and Satya Nadella’s frank statement that Xbox is going nowhere, Microsoft’s newly crystallized productivity focus be damned. But one thing appears obvious: Microsoft may have bitten off more than it can chew by leaping into the hardware waters so deeply and so suddenly over the past couple of years.